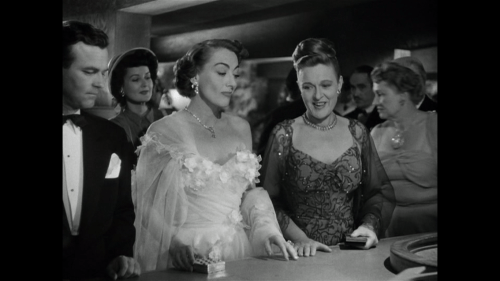 Another day, the same Joan Crawford; don’t be discouraged, Joan’s great in this film, but the film itself is so misogynistic that her character is only given enough rope by which to hang herself. The Damned Don’t Cry suffers from this, as well as far too many characters and an operatic plot that twists and veers, but never truly settles on where it wants to end up. It’s easily the weakest out of this week’s films. Ethel Whitehead (Crawford) is a poverty-stricken woman whose just lost her son in an accident. After leaving her husband, she ingratiates herself into society – both good and ill – on her way to transforming into the socialite Lorna Hansen Forbes. The Damned Don’t Cry is another cheapo film noir whose plot is a concoction of conventions that never fit together. The opening scene is a grim setpiece involving a body dump, and from there it becomes a sappy romance and a complicated mafia drama; all of which lack any discerning interest. Similar to Humoresque, there are elements of the script where I hoped it would deal with the double standards between men and women; questions of who the wealthy – particularly women – are allowed to associate with, and how prominent a role does crime pay in the lives of the wealthy. Unfortunately, all of this is pushed to the periphery in favor of more loveless romances and Crawford’s character being forced to learn her place as a woman. 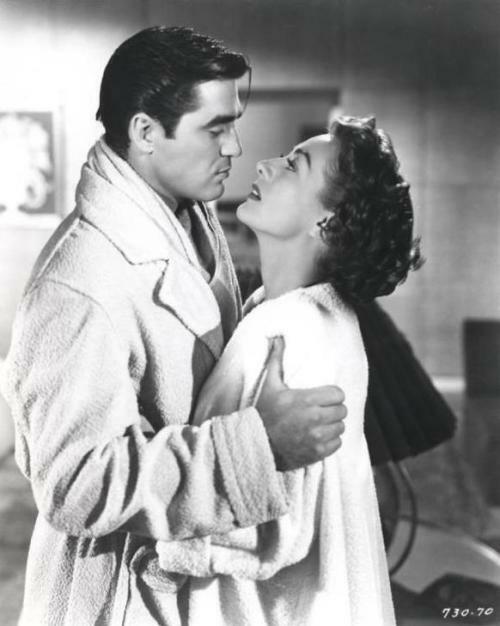 Crawford’s character is another Mildred Pierce; a desperate woman who wants something better for her child. Apparently, that’s all for naught because the child is unceremoniously killed and never mentioned. Ethel also has a husband, played by Richard Egan, but we never see him outside of the opening. The home life scenes do nothing more than to set up Ethel’s life that she wishes to escape from. It’s a fine start, but there’s no return to it other than in the climax where the characters sit outside. The gangster plotline is filled with two-bit gangster representatives that all want to be Scarface; the backroom elements and double-crossing are too confusing to accurately understand. The only element that’s sensible is Crawford’s role within it. It leads me to the film’s main flaw: its misogynistic tone. As with Humoresque, the plot attempts to be an empowering woman’s picture wrapped within the confines of a gangster film; a subversion of the genre that reverts back to patriarchal dominance. Ethel starts work in a modeling agency that makes the one in A Life Of Her Own look like a convent. The women of the agency are told to date prospective customers and take them to a secret “back room” where illegal gambling is held; one of Ethel’s friends says that “we get paid better at night.” Ethel refuses to work that way, and by reasons that are unexplained she works her way up the ladder. The problem is she immediately becomes a spider woman who takes a shine to an accountant named Grady (played by Cat People alum, Kent Smith). Ethel helps Grady become successful, leaving you with a confused message; do we condemn Ethel for controlling men, even though she’s elevating them to positions they wouldn’t be in otherwise? From there Ethel becomes Lorna Hansen Forbes, a wealthy socialite who becomes a gangster’s moll. Crawford is determined and cold (although it’s hard to believe, at 45, that Crawford is an ingenue), but only ever viewed as a sexual object by men. The third act hopes to mimic Notorious by having Lorna prostitute herself to a rival gangster only to fall for him. It’s perfectly summed up by one of the gangsters, propositioning Lorna to whore herself out, with the saying “He’s a man first.” So, he’s stupid enough to fall for Lorna, not because of her personality but simply because she’s got breasts? And because Lorna’s a woman she’s forced to put her life in danger because of her gender? It’s a problematic movie that gets worse in the third act when Lorna is beaten for her insubordination and killed. Why does Crawford’s character have to die? In Humoresque, she sacrifices herself (against character type) in order for her love to succeed. Here, she dies simply because she’s a woman whose given her sexuality too freely. It’s not enough that she’s trying to make her way in the world, and has suffered the loss of a child; she’s worked in the wrong line of work (a perversion of the American Dream), and been far too sexual….therefore, she’s been judged and punished. 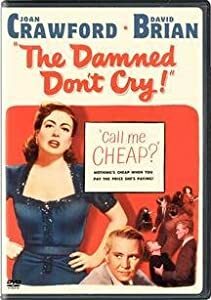 In the end, The Damned Don’t Cry compelled me to cry with sadness at Crawford’s brutalization, and presumed guilt, at the hands of men. Crawford is good, but she’s playing off-shoots of characters she’s done far better.